Visual Interfaces for Mobiles @ NCSU: Find: Windows 8 preparing for a beta tablet release at September PDC? Find: Windows 8 preparing for a beta tablet release at September PDC? Ms plans to use win for tablets, not win phone. Windows 8 preparing for a beta tablet release at September PDC? You don't need us to tell you what you already know in your gut to be true: Redmond is working hard on its tablet strategy. How embarrassing is it for Microsoft, the company that pioneered tablets and the 7-inch UMPC, to be completely absent from the conversation in 2010 and 2011? That could change in September. Microsoft watcher Mary Jo Foley recently shared the slide above which she believes to be 99.99 percent genuine. 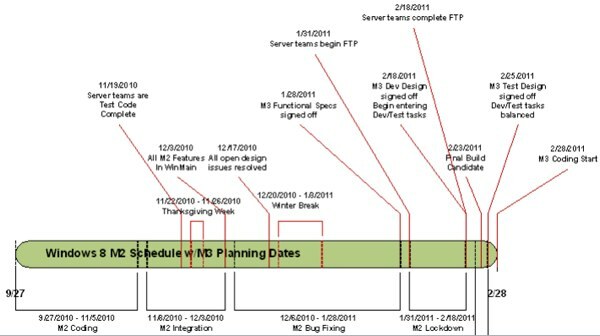 The timeline shows the major milestone dates for a Windows 8 (aka, "Windows Next") release -- an OS that M. JoFo believes to be focused on tablets (aka, "Lap PCs" in Microsoft parlance) with its purpose-built touch-centric design. According to the slide, we're looking at an M2 milestone this month followed by M3 in July or August. Foley says that would put Microsoft on track for a Windows 8 beta release right around Microsoft's Professional Developers Conference (PDC) event in September followed by a second beta in 2012 before being released to manufacturing around the summer of 2012 -- just like we heard early last year and just in time for Dell's Hancock tablet. There are still many open questions including Microsoft's ARM vs. Intel priorities and how the company plans to scale across the enterprise and the "workhorse PC" and "Family Hub PC" in the home. Hit the ZDNet link below for a deeper read or better yet, head on over to TechRepublic where Mary Jo Foley put together an excellent webcast outlining Microsoft's tablet strategy in much more detail. Windows 8 preparing for a beta tablet release at September PDC? originally appeared on Engadget on Tue, 22 Feb 2011 07:44:00 EDT. Please see our terms for use of feeds.